There are different ways to clean button mushrooms but this is the way i follow,Check it out. Take water in a wide vessel add 1 or 2 teaspoon of wheat flour and dissolve it. Add the mushrooms and soak it for a minute. Then gently massage each mushrooms to remove all the impurities. Wash them and cook as you wish. a) Grease your hand with some oil before you start to clean the banana flower to avoid staining your fingers and sticking to your hand. b) Choose a fresh banana flower. c) Remove the red petal and discard under the petal you will find row of flowers save them.Repeat this process till the flower becomes small. d) Now take each flower from the bunch,remove the white cover and the stamen from the flower we will not be using this in our cooking ( see picture). e) Put it in a bowl of water or buttermilk to prevent from changing colour. f) Chop the flowers finely and cook.Cook the flowers while they are fresh. 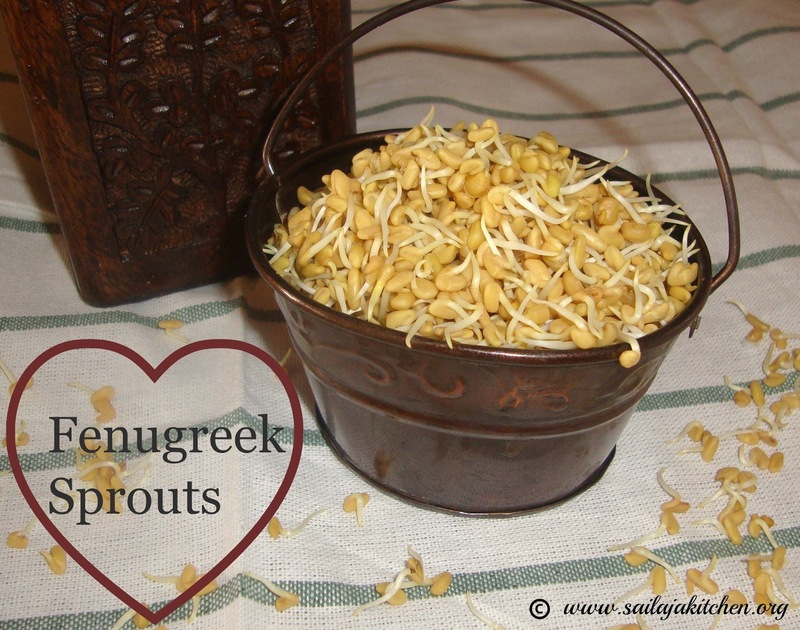 Wash the fenugreek seeds in water. Soak the seeds in fresh water,make sure the seeds are immersed well. Let it soak in water overnight. Next day rinse the seeds with fresh water for 2 times at least. Take a container here iam using a steel thermos lunch box,you can use any container to make sprouts. Line it with a kitchen tissue or a muslin cloth. Place the seeds on the tissue,sprinkle water generously.Fold it all four sides and close it with a tight lid.Sprinkle water in intervals if needed. Keep this for another 12 hours,you will see the seeds has started to sprout. If you want long sprouts then keep it for another 6 to 12 hours. Remove from the kitchen tissue loosen them & store it in a clean container in fridge. You can use the same method in making any kind of beans or seeds.For beans soaking & sprouting time takes longer. Cut the stem into thin slices you will find the fibers connected to the slice & the stem. Gently remove the fibers by using your fingers. Repeat the same till all the fibers are removed. Chop then into small pieces & soak it in water to avoid blackening. Cook the stem immediately.Do not store it in fridge once cut. Chop it finely and add it to diluted buttermilk. Take a wooden stick (i used chop sticks ) and swirl it in circular motion for couple times. Remove the stick from the buttermilk you will find the fibers are stuck to the stick. Gently remove & repeat the process till all the fibers are removed. Rinse & then cook it to your choice. Take all the above mentioned ingredients together in a bowl. Wash well & soak it in water for 3 hours. Grind this to a semi smooth batter in grinder or blender. Add water in intervals while grinding.Consistency of the batter should be semi thick. Remove it in a bowl add salt and mix the batter well. Next day beat the batter,remove needed batter into a bowl. Add little water & dilute the batter if very thick. Heat a tawa spread a ladle of batter,drizzle oil around the dosa & leave it to cook. Once brown on one side remove it from tawa & enjoy with chutney or sambar!. Wash & soak rice and methi in enough water. Wash & soak urad dal in another bowl. Soak both at least for 3 to 4 hours. Drain out excess water from the urad dal,add it to the grinder & grind for at least 40 minutes. Sprinkle water in intervals till you get a light & nice fluffy batter.Transfer to a wide bowl. Same way grind the rice and methi for at least 30 minutes to a smooth batter.The batter should be little thicker than urad dal batter. Transfer to the urad dal batter,add salt mix everything well. Cover & leave it to ferment overnight or for at least 12 hours. Next day beat the batter and its ready to use. a) If making Idli do not dilute the batter,just beat the batter & steam them in greased idly plates. 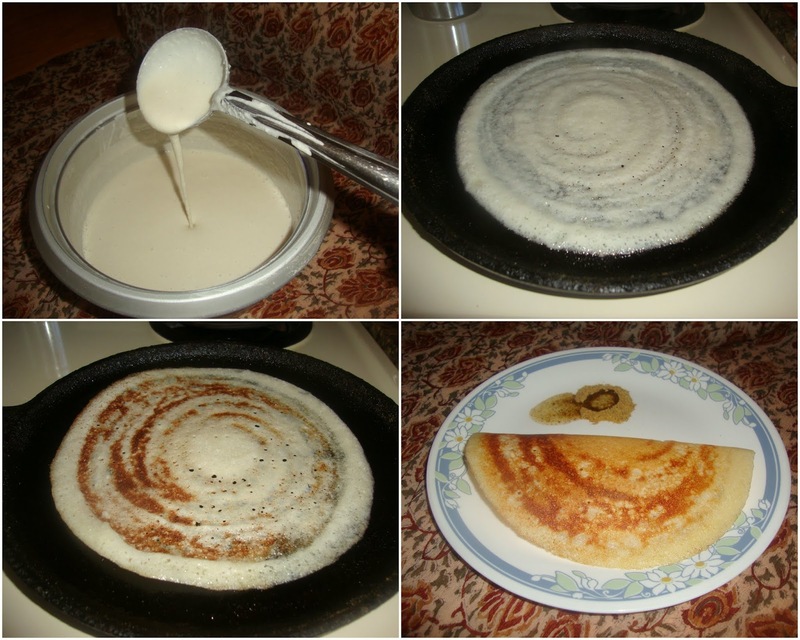 b) If making dosa then dilute the batter to a semi thick batter. c) The texture of the batter totally depends upon the quality of urad dal.Increase the urad dal quantity if you think there is no volume. d) Always make Idly with fresh batter. e) For extra softness a handful of poha/aval or cooked rice can be added while grinding batter. Grind all above ingredients together without water to a smooth paste.Mix the oil to this mixture,put it in a container & store it in fridge.Your homemade ginger & garlic paste is ready. Note: By this way you can store it more than a month,still looks & smells fresh.